I studied Music to degree level at the University of Birmingham, and alongside my teaching, I regularly perform as a member of an award winning local concert band and with my saxophone quartet. I am currently based in central Reading with easy access to the station and am able to travel if required. My hours are flexible as I work part time - I can offer weekend and evening slots as well as daytime slots on Wednesdays and Thursdays. A qualified teacher who has been teaching Music in an 'outstanding' secondary school for the past four years. I have experience of teaching Music up to A Level standard (currently I am teaching to the Edexcel A Level Specification and AQA GCSE specification). 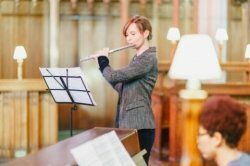 I also teach one-to-one instrumental lessons, and I am able to offer tuition on flute, clarinet and saxophone, as well as music theory tuition. This includes entering students for ABRSM practical and theory exams. I aim to tailor my sessions to the needs of each individual student, whilst making them fun and engaging. RuthFrom Sondre (5/5): Great teacher! Friendly. Punctal and reliable. Adapts her teaching to your level, but always make you strive for improving. Teaches a variety of styles. Seamlessly mixes technique exercises into learning new tunes.